book along with links to the Debunking Evolution videos that address each topic in parenthesis. 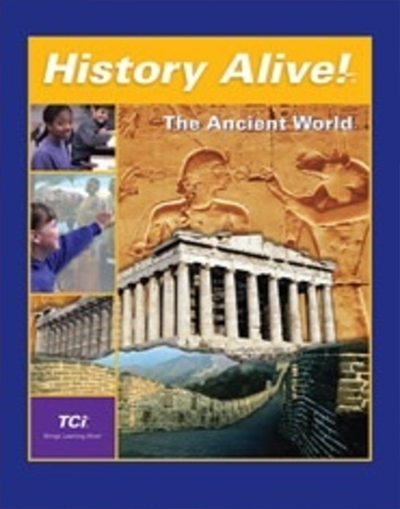 These books are typically used in the 6th grade in California schools, and teach in the opening chapters (Prentice Hall, pp. 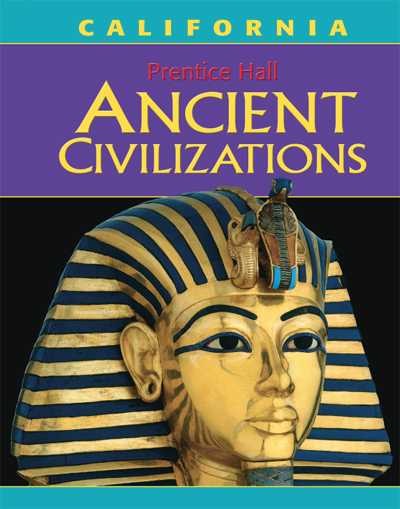 6-28, 2006 and Holt, pages 24-35, 2006) that humans evolved from ape-like creatures starting about 200,000 years ago. Note that the apparent of “progression of tools” in the above three images does not even represent actual items that were found with these skulls! 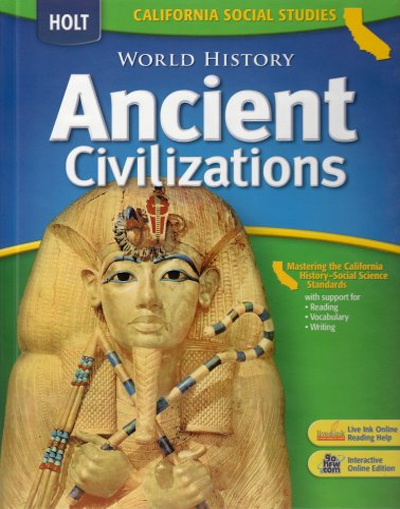 Most junior and senior high school textbooks teach that humans evolved from ape-like creatures. This is very different than what the Bible teaches. According to the Bible (in the very first chapter of the first book—Genesis 1), both apes and humans were created on the Sixth Day of creation, but they were created as very different types of beings. For starters, only humans were created in the image of God (Genesis 1:26-27). Jesus confirmed that humans were in fact created at the beginning of creation (Mark 10:6: “But at the beginning of creation God ‘made them male and female’”), not long ages after creation was completed. In fact, humans were the very last of God’s creations, and we were created to rule over the earth and all other animals that God created. Eve was created by God to be a perfect mate for Adam’s—filling in all the areas that Adam lacked as a man. Only together do they form “man” in the well-rounded way that God wanted us to be. Eve was also given place as the “mother of all the living” (Genesis 3:20). Other parts of the Bible even confirm that mankind is the most special of all God’s creations. For example, 1 Corinthians 15:39 says, “All flesh is not the same flesh, but there is one flesh of men, and another flesh of beasts, and another flesh of birds, and another of fish.” Because humans are made in God’s image, were God’s last and final creation, and put in charge over all of His creation, it would make sense that humans today (and at the beginning) would be designed much differently than all other living things. It would only make sense that we would live longer than most, be smarter, and able to plan ahead. Humans do lots of things that apes cannot. Just a starter list includes advanced speech, math, singing, worship, prayer, holding ceremonies, creativity, and love. Truly, we were designed to take care of His creation. We are more equipped for this than any living thing, even if we don’t make the right choices sometimes! The following sections will review each one of the supposed “ape-to-human” transitions as well as disprove them using Creation Science. In 1974, Donald Johansen discovered a fossil in Ethiopia, Africa. Although the skeleton was only 40% complete, Mr. Johansen declared that the fossil was the “missing link” between man and ape. The fossil was nicknamed “Lucy” and given the scientific name of Australopithecus Afarensis. Although the name sounds impressive, Australopithecus simply means “southern ape.” Since then more Australopithecine fossils have been found so we now know more about them. 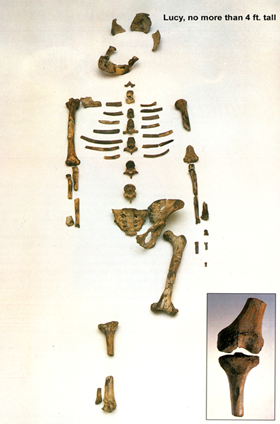 The narrator states the problem – Lucy’s hip bone fossils show that she could not have possibly walked upright like humans do. Dr. Lovejoy said that the fossils must have been stepped on and broken, so they only appear to be like a chimpanzee’s hip bones. He proceeds to “fix the problem” by making a plaster cast of the fossils, cutting them into pieces, and then reassembling them “the way they were before Lucy died.” As the camera zooms in on Dr. Lovejoy’s new creation, the narrator triumphantly announces that Lucy’s pelvic bones were a lot like ours. So the question is, “How did Dr. Lovejoy know what Lucy’s bones looked like before she died?” Obviously, his creation was heavily influenced by his prior beliefs that we evolved from ape-like ancestors. This is a great example of someone trying to make the facts fit the theory of evolution. So was Lucy really our ancestor? No, she wasn’t. Unfortunately, many evolutionists assume we evolved from ape-like creatures. They often try to make the facts fit into their theory and ignore facts that don’t fit. Lucy exhibit featured at the St. Louis Zoo. Source of photo: Lucy She’s No Lady, Dr. David Menton, Answers in Genesis. Lucy She’s No Lady, Dr. David Menton, Answers in Genesis. J. Stern & R. Sussman, 1983 American Journal of Physical Anthropology 60:279-317 p. 284. Science News April 8, 2000 P 235 “Lucy on the Ground With Knuckles” Richmond and Strait, Nature March 23. J. Stern & R. Sussman, 1983 American Journal of Physical Anthropology 60: 279-312. J. Stern & R. Sussman, 1983 American Journal of Physical Anthropology 60:279-317 pp 291 & 292. “In Search of Human Origins” 1994 PBS Nova Series, Episode One. Charles Oxnard (professor of anatomy and leading expert on australopithecine fossils), The Order of Man: A Biomathematical Anatomy of the Primates, 1984, p 3. In 1964, Louis Leaky, Phillip Tobias and John Napier announced in Nature the discovery of a new human ancestor: Homo habilis. The original fossils were said to be 1.8 million years old and consisted of scattered skull fragments, hand bones and foot bones from four juvenile specimens. According to Louis Leakey, the foot bones showed signs that Homo habilis may have been able to walk upright on two feet, and the hand bones indicated a high degree of manual dexterity. However, since these bones were not found next to the skull fragments, there was no concrete proof that they belonged to the same creature. Some scientists believed that the Homo habilis fossils were just a mixture of australopithecine (ape) and Homo erectus (human) fossils--not a new species. Some primitive stone tools were also found at the site. Originally scientists claimed these tools belonged to another supposed missing link known as Zinjanthropus (who incidentally, turned out to be just an ape). Now Louis Leakey claimed the tools were used by these new fossils. This was the reason for naming these fossils “Homo habilis” or handy man. In 1986, Tim White and Don Johanson discovered a partial adult skeleton. Since the fossil was discovered in Olduvai Gorge, it was designated “Olduvai Hominid 62” and was dated (by evolutionists) at 1.8 million years old. Because the skull and teeth were similar to the original Homo habilis fossils found in 1964, the new fossil was said to belong to the same species. This presented three big problems for evolutionists! The body of Olduvai Hominid 62 was rather ape-like and smaller than the famous australopithecine fossil known as Lucy. (1) Since Lucy was just slightly over three feet tall, and Homo erectus fossils grew to be about six feet, Olduvai Hominid 62 should have been somewhere in between them if Homo habilis was truly a missing link. Since the body of Olduvai Hominid 62 was ape-like, it seemed to support the belief that the original Homo habilis fossils found in 1964 were actually a mixture of australopithecine and human bones (most notably the hands and feet). If the fossilized hand and feet bones found in 1964 were actually human, then logically the tools found at that site were used by people living there. Although evolutionists keep trying to convince us that humans evolved from ape-like creatures, interpretations of the fossil record have been filled with mistakes, fraud and fantasy. The truth is we were created by God on day six of creation week. Since the beginning, humans have always been humans and apes have always been apes. Lubenow, Marvin. Bones of Contention: A Creationist Assessment of Human Fossils. Grand Rapids, MI: Baker Books, 2004. p. 115. Despite what public school textbooks say, creation science proves the point that “homo sapiens” or “homo sapien sapiens,” are all simply human! Do you have questions regarding the information found on this page? Contact Genesis Apologetics to get in touch with a knowledgeable member of our ministry team. We gratefully acknowledge the excellent work and resources developed by of our allies such as Answers in Genesis (AIG), Creation Ministries International (CMI), the Institute for Creation Research (ICR) and others.